Owning a fish finder is the best way to ensure you catch the biggest fish in the pond. You don’t want to set up and hope you can catch something. There are many fish ﻿﻿finders available, and while they have the same operation, some are better than others. Whether it’s their features or their operation, not all fish finders are created equal. You may wonder what the best finders include, and the answer is quite simple. Garmin is known for their navigation devices, and using a Garmin fish finder can help you secure any area, and lock into your target. If you’re looking for one that suits you, this review is for you. The Garmin fish finder reviews will look at some of the best Garmin fish finders available, allowing you to find one that will fit your needs. You can catch any fish you want, and a fish finder will help you. 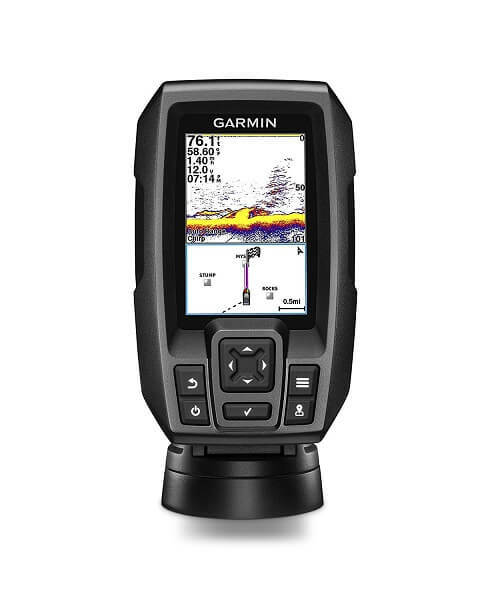 Garmin, the worldwide leader in GPS’s, is also the creator of some very capable fish finders. The 4Cv comes with a built-in GPS that allows you to record up to 5000 waypoints, almost double that of the Humminbird model. It also comes with high tech mapping software that allows you to create and save maps with one-foot contours for up to two million acres. Its built-in CHIRP sonar allows for you to see fish clearly so that you can figure out the best strategy for how to fish it out. The clarity of these screens is remarkable, and you can easily make out what is a fish without having to play the guessing game. If it helps, it can also display how fast your boat is going. You can be able to tell either in miles or kilometers per hour the speed of your boat, so that you are more careful not to scare away any fish that are nearby. The one problem with the 4Cv is that the screen is just too small. It is not sufficient enough with it being in a portrait style, opposed to a landscape style, but you really have to get very close to it in order to see all the details that it shows. The Garmin Striker 7SV has a rugged design, making it practical for anyone that loves to have a little adventure on their fishing expedition. It complements your lifestyle and will work in the harshest marine environments. No matter where you’re planning on fishing, this fish finder works. The highly sensitive GPS allows you to pinpoint the fish in your area. You won’t lose track of your position, especially if the weather starts to move in. It is practical for anyone that needs a fish finder that will work well for them. You can see your speed to give you a hand if you get lost. The waypoint map makes it easy to find the best ways around a body of water. You can view and mark your favorite positions to come back to them later. You can navigate through brush piles, stumps, and docks to prevent an accident. You’ll appreciate having this Garmin Striker 7SV in your boat. The CHIRP ﻿﻿sonar tells you when a fish comes into your path. It provides a continuous sweep of the water, providing excellent coverage. The frequencies work low to high, allowing you to get the most information possible. It has better target separation than other fish finders. The flasher is built into the fish finder, allowing you to use the fish finder how you want to use it. Whether you’re jigging, or ice fishing, you can use the flasher to your advantage. The fish can’t hide when you have all the tools at your disposal. You will know your exact location with the Garmin Striker 4. It uses a highly sensitive GPS to track your location. You won’t get lost, and you can track your favorite spots with the GPS. This is practical for those that want to try out new fishing holes, and see what they find. The color display allows you to find out what is a fish, and what is debris. You can determine where the fish are located, and where they’re going. The fish finder is easy to tell what is a fish, and what is not. The Striker 4 uses a CHIRP sonar that alerts you when a fish comes into range on the fish finder. No matter how far away they are, you can determine where they’re located. This is ideal for anyone that wants to be notified when the fish are in their paths. The screen measures 3.5-inches, allowing you to locate the fish in your area. No matter where they’re hiding, you’ll be able to spot them on the fish finder. This is ideal for those that don’t want to guess what they’re looking at. No matter what the fish finder picks up, you can see it easily. The operation on the Striker 4 is easy to use, allowing you to set it to your preferred settings. You can select your favorite fishing spots, and see where the fish finder will take you. The settings can be adjusted for your preference, allowing you to find any fish in your area. You can use the CHIRP 94sv quickly and easily. You can pinpoint your favorite locations, and read the screen easily in the sunlight. It’s practical for any fisherman that needs to know where they are. The CHIRP sonar allows you to find the location of any fish, anywhere. It does a continuous sweep under the waves to let you know where the fish are hiding. The chirp sounds from low to high, allowing you to be notified of where the fish are located. You can use the map feature to fish in the U.S. or Canada. This is practical for taking the fish finder out on new bodies of water, and see what you can find. It’s ideal for those that want to try a new fishing spot. The GPS allows you to find out where you are, and where you’re going. You won’t have to get lost over and over when you know exactly where you are. This is ideal for any fisherman that hasn’t been on a body of water. The CHIRP sonar provides clear notifications, allowing you to seize the proper spot of the fish’s location. This is practical for those that are focused on driving their boat. No matter what you’re doing, you’ll know the fish finder has a hit when the notifications go off. When you get a hit, the Garmin GPSMAP works quickly to notify you of any fish in your area. This is ideal for those that want to know when they have a hit. You can tell when the fish finder picks up a fish in your area. The Garmin GPSMAP 721xs includes a built-in support system, allowing you to use other Garmin transducers. No matter what you want to add to your fish locator, you can rely on the fish finder working with any Garmin product. 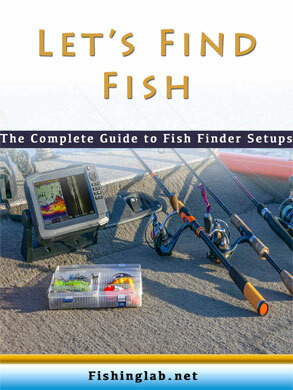 This is ideal for those looking to upgrade their fish finder. You can tell what the fishfinder is picking up, quickly and easily. No matter if it is a fish or a piece of debris, you can tell what the fish finder is picking up. You can add different scanners to help you locate the fish in your area. They won’t stand a chance when you have the advantage. If you love sailing, you can use the fish finder for sailing. You can tell the lay lines, and the enhanced wind rose. You can feel like a professional sailor when this fish finder tells you everything you need to know. It’s practical for those that have a different option available to take a break from fishing. There is an app you can download to help make your fishing expedition a success. The app allows you to use your Apple device to make the fishing trip one to remember. It’s practical for those that want a more hands-on experience with their fish finder. The Garmin echoMAP CHIRP 53dv is easy for anyone to use. You can read the display easily in the sunlight, and make the settings easier for you. If you’ve never used a fish finder before, you need one that is simple to use. This is the perfect fish finder for those just starting out. The CHIRP sonar is ideal for those needing to get more information. Since it does a continuous sweep, you can get more information. This is ideal for those that have never fished out in open water. The built-in maps and charts allow you to plot your destinations and routes quickly and easily. You can use the maps to find out where to take your next fishing trip while taking in some new sights. The internal GPS is always updating your position, allowing you to stay on top of where you are. No matter where you’re fishing, knowing where you are will help you find your favorite spot. The internal GPS is one of the best ones available, and you’ll appreciate how well it works. When the CHIRP 53dv is scanning the water, you will know what you see on the screen. This is practical for anyone that wants to make sure they’re in the right spot. You won’t have to determine whether you’re looking at a fish or something that is blocked by brush. The Chirp 74SV provides a clear view of what the fish finder is picking up. You can see more of everything around you with the fish finder. The sonar uses high frequencies to give you a better view of everything in your area. This is ideal for separating the fish from the debris. The CHIRP sonar is ideal for those needing to get more information. Since it does a continuous sweep, you can get more information. This is ideal for those that have never fished out in open water. If you’re trying to catch a big fish, you need a fish finder that works constantly. You can use the Chirp 74SV for maps of the U.S. This is ideal for those that want to explore new places in the U.S. When you can change your travel routine; you can try out new fishing methods. This is ideal for those that want to get into a different fishing spot. The fish finder uses two methods of sonar to help you find the fish. It uses the traditional CHIRP sonar, and the CHIRP scanning to help you find the fish. Using multiple sonars allows you to cover more turf when you’re out on the water. You will have a better chance of catching a fish that comes near your boat. You can use the CHIRP 73dv quickly and easily. You can pinpoint your favorite locations, and read the screen easily in the sunlight. It’s practical for any fisherman that needs to know where they are. The internal GPS is always updating your position, allowing you to stay on top of where you are. The internal GPS is one of the best ones available, and you’ll appreciate how well it works. The built-in maps and charts allow you to plot your destinations and routes quickly and easily. It’s ideal for those that want to try out a new area to go fishing in, especially if they’ve never been there before. The CHIRP sonar allows you to pinpoint the location of any fish, anywhere. It does a continuous sweep under the waves to let you know where the fish are hiding. The chirp sounds from low to high, allowing you to be notified of where the fish are located. The CHIRP 73dv provides a clear view of what the fish finder is picking up. You can see more of everything around you with the fish finder. The sonar uses high frequencies to give you a better view of everything in your area. This is ideal for separating the fish from the debris. You can use the CHIRP 44dv quickly and easily. You can pinpoint your favorite locations, and read the screen easily in the sunlight. It’s practical for any fisherman that needs to know where they are. The built-in maps and charts allow you to plot your destinations and routes quickly and easily. You won’t have to guess where you’re going, and you won’t get lost easily. When the fish finder is scanning the water, you will know what you’re looking at on the screen. This is practical for anyone that wants to make sure they’re in the right spot. You can tell what you’re looking at easily, thanks to the high definition screen. No matter if you’re looking at a fish or some debris, you can clearly tell what you’re seeing. This is the best way to determine what you’re seeing. You can scan up to 1500 feet with the down scan, allowing you to pinpoint any fish’s location. It’s practical for those that want to make sure there isn’t any fish hiding deep in the water. If you’re deep sea fishing, you want to make sure you can see as far down as possible. The Garmin echo 200 provides a smooth scaling technology, allowing to keep an eye on the water. No matter if you’re changing depths, you won’t lose a signal to the fish finder. This is ideal if you’re trolling for fish, and need to keep going down further into the water. The Garmin echo 200 includes a mount and goes system, which is ideal for those that want to spend more time fishing. It doesn’t require a complex system that may not work with this fish finder. This is practical to getting back out on the water, instead of playing with the fish finder. When you’re fishing, you may come across an excellent spot. When you decide to go back, you may have forgotten where it was. Your worries can be set aside when you can go back and see where you were. It’s practical for anyone that loves to go fishing. A fish finder is a perfect tool to help you locate and catch any fish. They offer plenty of information and different features to help you catch the fish of your dreams. While there are many fish finders available, Garmin is one the best makers of fish finders. 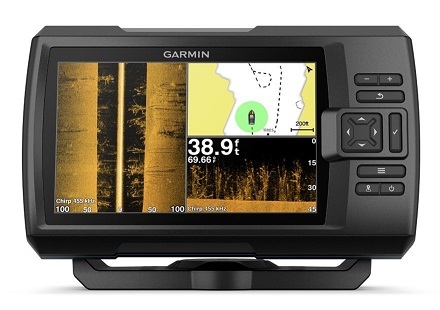 If you are searching out best Garmin fish finder reviews, then you have already made the first step to finding the excellent one to satisfy all your wishes. As one of the leaders of fish finders, the Garmin Striker 7SV is one of the best fish finders available for any fishing lover. It works well and is rugged enough to fit any lifestyle. You’ll love having this fish finder on your boat if the water gets rough, and water starts to spill over the side.